The Production Assembly Learning System (950-PAS1) teaches fundamentals of assembly skills used throughout modern industry. High quality assembly skills are in short supply, with the impact being more product failures which lead to increased costs, customer dissatisfaction, and in some cases, safety issues. Students will learn industry-relevant skills including how to identify and safely handle torque wrenches, operate both click-type and air impulse torque wrenches, properly sequence fittings, install, operate and maintain O-rings and lip seals, assemble hoses and couplings, route hoses including using clamps, brackets and clips, identify and install STOR and Zerk hydraulic fittings, and handle both steel and plastic tubing. 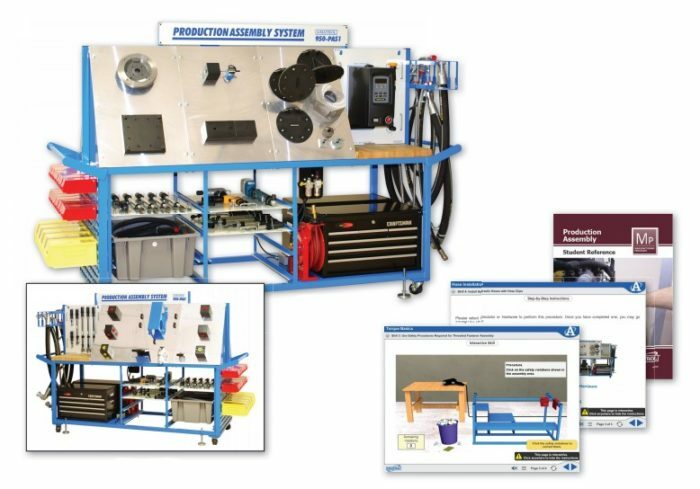 The model 950-PAS1 includes a mobile workstation, mechanical panels, hose kit, fastener kit, fitting kit, bin kit, consumables kit, miscellaneous tool kit, torque fixture kit, torquing fasteners panel, fitting torque wrenches panel, back-up wrenches panel, electric and pneumatic tools panel, protective plug / cap kit, CD-ROM based student learning materials for both theory and lab, and teacher’s assessment guide. The CD-ROM based curriculum includes virtual simulation of key skills, allowing learners to practice skills in advance of actually working on the equipment. This system uses industrial quality components to help assure that students are better prepared for what they will encounter on the job and to withstand frequent student use. The CD-ROM based curriculum can be accessed locally or web delivered, allowing businesses to increase delivery of high quality assembly practices in far flung organizations. Options available to expand the 950-PAS1 even further include a Split Flange Learning System (95-PAS2), Electric Torque Wrench Learning System (95-PAS3), Stall Bar Learning System (95-PAS4), and Instrumented DC-Electric Torque Wrench Learning System (95-PAS5). The 950-PAS1 focuses on building high quality assembly skills as well as the knowledge to understand and troubleshoot common assembly problems. For example, hose assembly frequently leads to many issues such as incorrect installation of o-ring face seals (ORFS) which leads to early product failure. The 950-PAS1 tackles this problem as well as the challenges that arise with improper hose routing where force on the hose leads to product failure. Students can route hoses through an obstruction on the trainer to learn about the impact improper routing can have. The importance of sequence tightening is often misunderstood in assembly operations. The Production Assembly Learning System uses an 8 hole pattern block to teach learners that the tightening sequence makes a real difference to product quality. One of the tough things to convey and teach is the need to use torque accurately – that force does matter in assembly operations and that more is not always better. For example, manual torque wrenches are used to show the effect of improper hand position and incorrect torque compared to the result achieved with correct hand position and correct torque. Likewise, bolt stretch is another common assembly challenge associated with incorrectly applied force that is often not well understood in the manufacturing floor. Students can see the impact of this when using the bolt stretch feature on the 950-PAS1. Amatrol’s unmatched multimedia utilizes text, audio, and stunning 3D animations that engage learners in both theoretical knowledge and hands-on skills. This thorough, exceptionally detailed curriculum is built to begin with the basics and steadily advance to more complex concepts and skills. Through partnerships with key industry leaders and leading edge educators, Amatrol developed the right balance of knowledge and applied skills needed to train learners to work in their chosen field. The multimedia curriculum is fully integrated with the equipment trainer or learners can choose to use a virtual simulator. Virtual simulation allows learners to practice hands-on skills at the desktop, greatly shortening the learning curve on the actual equipment. This is the perfect instructional tool for today’s workforce with an exciting presentation and high quality learning content.